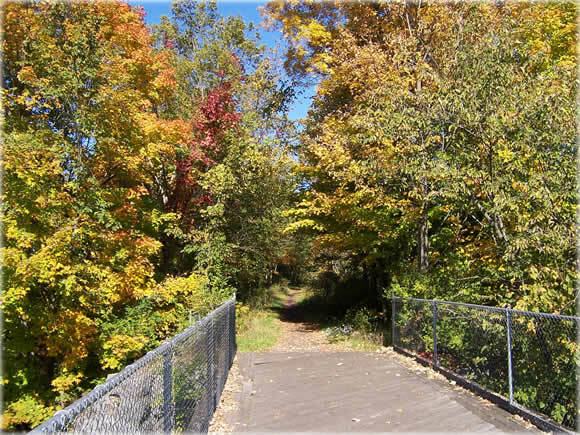 Rail Trail in Ulster County, NY. Photo by Steve Bergstein. It's starting. The gradual change into Autumn. Some say the 13 weeks of Autumn are the most colorful time of the year. Take a moment and look at some of the special rituals, customs and celebrations you do each Autumn. Feel the magic of the season. It might be more colorful than you think! Technically, Autumn begins on the equinox day on or near September 21. For many of us, the season may begin on a different day that fits the way we live. "Back-to-School" sales signal Summer's end for students. For sports fans here in the US, Autumn is not official until the World Series or the start of Football, their own private signal that Autumn has finally arrived. For some, Autumn begins on that first cool night where the windows get closed and the heat comes on. When does Autumn begin for you? And when does it end? As the child grows, the parent grows too. Back-to-School for a pre-schooler's very first day is an unforgettable experience. How many parents can still hear the tearful screams of, "I don't wanna go!!!" (And how many parents secretly whispered, "There's a part of me that doesn't really want you to go…but I know you need to go.") That Autumn day, the very first day of school, marks a rite of passage for both the student, and the parent. Imagine these same feelings when any loved one departs the world they share with us, headed for the next, moving on to the new lessons they face in the next life. "There's a part of me that doesn't really want you to go…but I know you need to go." Back-to-School changes over the years. For students moving away to begin college, Autumn is a time of rebirth, of leaving the nest to begin a new life in the college dorms. Independence, discovery, interaction, perhaps new romance all come to life this Autumn! For parents of new college students, Autumn marks the time when these parents can begin to enjoy their empty nest again. After decades of caring for a busy family, parents eventually can rediscover the freedom to travel and live (almost) like newlyweds again. Independence, rediscovery, interaction, perhaps renewed romance all come to life. (Are you sensing a pattern here?) Perhaps one lesson the seasons have to teach is that life often comes full circle! Pollen as a Magical Tool? Ah-Choooo! (Bless you.) If your nose is anything like mine, you have no trouble recognizing when Autumn approaches. Autumn is pollen season, that time when plants release tiny bits of their essence into air, and into the next generation, to continue the cycle of fertility. Whether you have allergies or not, we all breathe in the seasonal pollens. We all take in these tiny reproductive vehicles with each breath we inhale. If you are a student of herbs, you already see how taking in parts of a plant often has physical, spiritual and magical affects. How might pollen affect us? We often work magically with the roots and leaves and flowers of a plant; how might we work with their pollens? In some areas, every May the tree pollen is so thick you can write your name in its dust. What else might you write? What might you be able to read in this thin green layer of tree pollen, if you scry hard enough? Pollen is just one way which our surroundings change with the seasons; look for ways in which these changes might affect you personally. With Autumn comes a gentle decline from Summer's intensity. The things that heat up in Summer begin to fade as Autumn slows things down a bit. How appropriate we also call this season "Fall." A gradual decline. Life begins to cool down, become gentler and more laid back. Like the leaves, life's intensity begins to "fall" as well. Summer vacations, Summer jobs, and Summer "flings" come to a close. We even lose an hour of daylight in Autumn; and gain an hour of darkness. See your own private use of that hour as your own celebration of the season. Some Autumn day when you find your self in a wooded place, take a moment and look around. You can see the leaves falling from their branches, floating down through the air, to rest upon the ground. As you watch the leaves fall, you can see the seasons change right before you eyes! Not many other seasons give that gift. As leaves fall, trees shed their "coat" for the season. How interesting that we do just the opposite. We put our thick wooly coats on when Autumn approaches, similar to the way animal fur thickens to warm them as cold weather nears. Autumn is a time of building ourselves, preparing for the Winter to come by bulking up just a bit. Harvest time is another way we prepare our selves. How fitting that Mother Earth yields the majority of Her crops just before the barren times of Winter. She stocks our pantries so that we can survive the entire cycle. What ways will you enjoy the harvest this year? What things will you do to prepare yourself for the Winter to come? Holidays like the American Thanksgiving Day are harvest feasts based on the agrarian wheel of the year. This Autumn, name a few of the things you are thankful for, and a few of the things you'd like to continue into the coming year. Autumn starts with Libra, the scales. Balance. How fitting that this symbol of balance comes on the Equinox day -- a day where light and dark are perfectly balanced. Autumn (and Spring too) are seasons of balance, in-between the extremes of Winter and Summer. They are a balance of the two. Are there two opposite forces in your life that you often juggle to achieve balance? Maybe work and play? Rest and stress? Or maybe "yes I will" versus "no I won't." We all balance the forces that shape our lives. Looking at the way the seasons achieve this balance, why would we be any different? What lessons can we get from the seasons to help us find the right balance? "To everything, there is a season, and a time for every purpose…"
In Autumn, what type of divination might work better than others? Perhaps using something related to the harvest? If you use divination tools, try using nuts or leaves or acorns that appear at this time of year. Not only are these things charged with the energy of the season, they might be fun to use too! Acorns and leaves are especially good to use together. Notice how the Oak drops its acorns first, then a few weeks later covers them with its leaves for a cozy winter bed in which to take root! In Autumn comes Samhain, called All Souls Day or Halloween by some, a day to honor ancestors. We all have many types of ancestors, including the ancestors within ourselves. This Samhain, in addition to your ancestors, try honoring each of your own previous incarnations. In a way, they too are ancestors of sorts. They too are your predecessors who came before the current "you" -- helping to shape your existence today. Perhaps Autumn might be a good time of year to try past life regressions, especially around Samhain.